With summer approaching before you know it, you may be thinking about your next vacay. A peruse of the website VueVoyage could inspire you to take a trip to the Ice Hotel in Jukkasjarvi, Sweden, the Waldorf Astoria in New York City (best known as hotel of choice for King Jaffe Joffer of Zamunda), or the Zhangye Danxia Landform in Gansu, China. Even if you have no plans to hop on a plane, add VueVoyage as another Web-based option for virtual travel. VueVoyage is an image-based, travel-focused social network that lets you explore select destinations around the world. Its contributors and editors have culled together photos (many sourced from Flickr photographers) and editorial insight from locations as far-reaching as the Seychelles, from landmarks to hotels. The site launched in 2014, and has built a participating audience of armchair travelers. 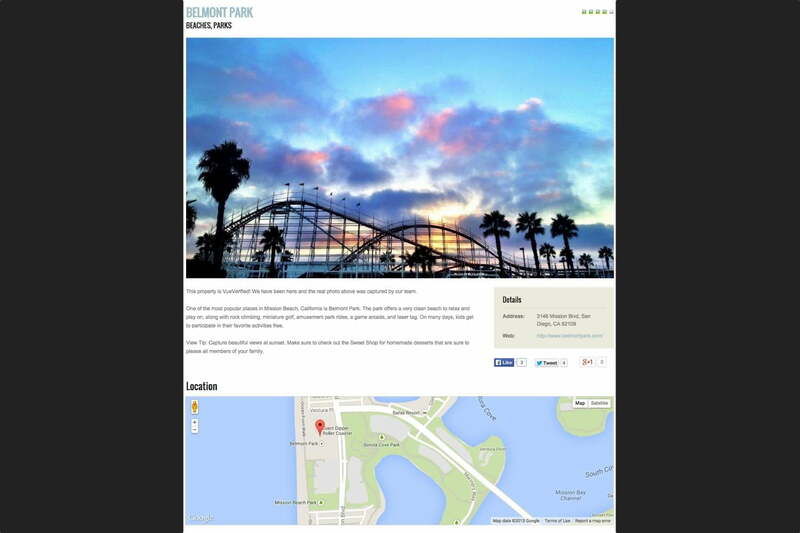 The site uses Google Maps as its backbone, and lets users upload and rate photos. Users can then browse the map by clicking on thumbnails to find out more information about the location, as well as find tips on what to look for if you actually visit. They can also browse by categories, such as hotels, nature, and architecture, and contribute a review or comment on any of the destinations. But does VueVoyage just cure wanderlust by offering that virtual experience, or does it make that travel itch burn just a little bit stronger? Even the site’s co-founder feels the nudge to visit every new location that pops up on the map. Exotic locations are one of the major attractions for VueVoyage. Even if you have no intention of visiting a destination, it’s still intriguing to see where others have traveled. “In the sense of it being a cure, I think in addition to the typical hot-spots around the world, we also offer places that are more off the beaten path, allowing travelers to do more exploring,” Trebisovsky says. The entire world is big place to explore. VueVoyage does let you take a trip around the world in 100 or so clicks, but the site narrows down your virtual trip by limiting your exploration to specific countries, cities and states, and categories. VueVoyage editors also develop destination packages, which give site visitors a way to find places around a theme or topic. For example, America’s national parks will get special treatment during National Park Week, which runs from April 18 to 26. The package, titled “Top Ten National Park Views,” puts a spotlight on the parks, but also brings out the most striking images and locations. Additional packages that the site has culled together include favorite infinity pools, favorite rooftops around the world, best views of the 2014 World Cup in Brazil, and best views of the Monaco Grand Prix, which takes place May 21 to 24.